In a world increasingly faced with, and divided by, regional and global crises, resilience has emerged as a key concept with significant relevance for tourism. A paradigmatic shift is taking place in the long-term planning of tourism development, in which the prevailing focus on sustainability is being enhanced with the practical application of resilience planning. This book provides a critical appraisal of sustainability and resilience, and the relationship between the two. Contributions highlight the complexity of addressing social change with resilience planning in a range of tourism contexts, from islands to mountains, from urban to remote environments, and in a range of international settings. Case studies articulate how tourism is both an agent of social change and a victim of larger change processes, and provide important lessons on how to deal with increasingly unstable economic, social and environmental systems. 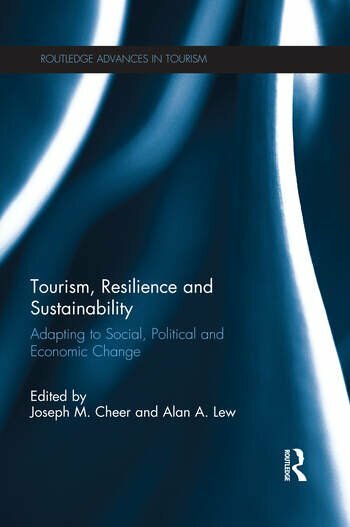 This is the first book to specifically examine social change and sustainability in tourism through a resilience lens. This much-needed contribution to the literature will be a key resource for those working in tourism studies, tourism planning and management, social geography, and development studies, among others. 15. Backpacker tourism in Fiji as a sustainability intervention: Will they sink or swim? Joseph M. Cheer is a lecturer at the National Centre for Australian Studies (NCAS), Monash University and directs the activities of the Australia and International Tourism Research Unit (AITRU). His research draws from transdisciplinary perspectives, especially human geography, cultural anthropology and political economy with a focus on the Asia-Pacific region. He is focused on research-to-practice with an emphasis on resilience building, sustainability and social justice. Alan A. Lew is a professor and chairperson in the Department of Geography, Planning, and Recreation at Northern Arizona University, USA, where he teaches in geography, urban planning and tourism. His research interests focus on tourism in the Asia-Pacific region, particularly in East and Southeast Asia. He is the founding editor-in-chief of the journal Tourism Geographies, a Fellow of the International Academy for the Study of Tourism and a member of the American Institute of Certified Planners.